Researchers are now proposing a new strategy for targeting shots that could, at least in theory, stop a pandemic from spreading along the network of social interactions.Vaccinating selected people is essentially equivalent to cutting out nodes of the social network. As far as the pandemic is concerned, it’s as if those people no longer exist. 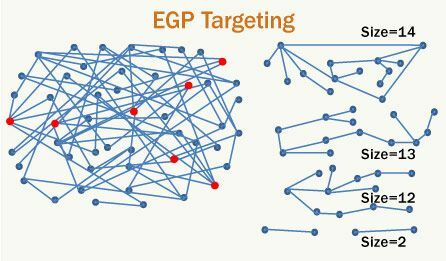 The team’s idea is to single out people so that immunizing them breaks up the network into smaller parts of roughly equal sizes. Computer simulations show that this strategy could block a pandemic using 5 to 50 percent fewer doses than existing strategies, the researchers write in an upcoming Physical Review Letters. So you break up the general social network into sub-networks, and then you target the most important nodes of these sub-networks and so on until you run out of vaccines. The challenge will be to get good information about social networks, something not quite as easy as mapping computer networks, but there is progress on that front. In one of the most dramatic illustrations of their technique, the researchers simulated the spread of a pandemic using data from a Swedish study of social connections, in which more than 310,000 people are represented and connected based on whether they live in the same household or they work in the same place. With the new method, the epidemic spread to about 4 percent of the population, compared to nearly 40 percent for more standard strategies, the team reports. Source: ScienceNews. See also Lifeboat’s BioShield program. This entry was posted on July 5, 2008 at 7:36 pm and is filed under Science & Technology, Security. You can follow any responses to this entry through the RSS 2.0 feed. You can leave a response, or trackback from your own site.